Looking for Detection Sniffer Dogs in Manchester or surrounding areas? You need to be able to rely on professionally trained dogs cared for by expert handlers who follow modern police/military standards of practice. Always ask for background information and testimonials from handlers. SpecialistK9 will help you achieve your objectives. We take pride in our work and only use methods of dog training and working schemes approved by the best standards authorities and government offices. We aim to provide detection services and sniffer dog solutions in Manchester that exceed your expectations. At SpecialistK9 we provide reliable sniffer dogs with a proven track record. Rest assured we have skilled handling teams with the right know-how for your project. Hospitals, hotels, public crowded spaces, festivals and car parks rely on detection dog checks throughout the Manchester area. 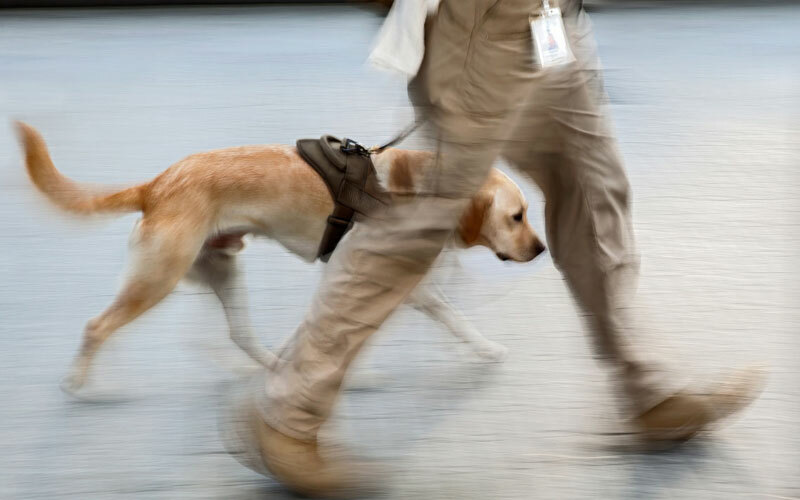 Detection dogs and handlers are complete reassurance for your customers and staff. We cover Central Manchester, Greater Manchester and all areas that are in easy access of the Manchester motorways – M60, M67 and M602. From care units in Stockport to commercial premises in Salford, our detection sniffer dogs work can include detection of illegal drugs, tobacco and even bed bugs. Police service work can consist of explosives screening, firearms, human trafficking. Commercial business owners might need our services for their mobile security patrols. Heard enough? Looking for detection sniffer dogs Manchester – Central Manchester or Greater Manchester areas? Need to contact us? Call, email or complete our contact form online. A helpful member of the SpecialistK9 team will discuss your project requirements with you. And remember – emergency alarm mobile patrol call out, hospital room searches and crowded arenas are all within the experience of SpecialistK9.